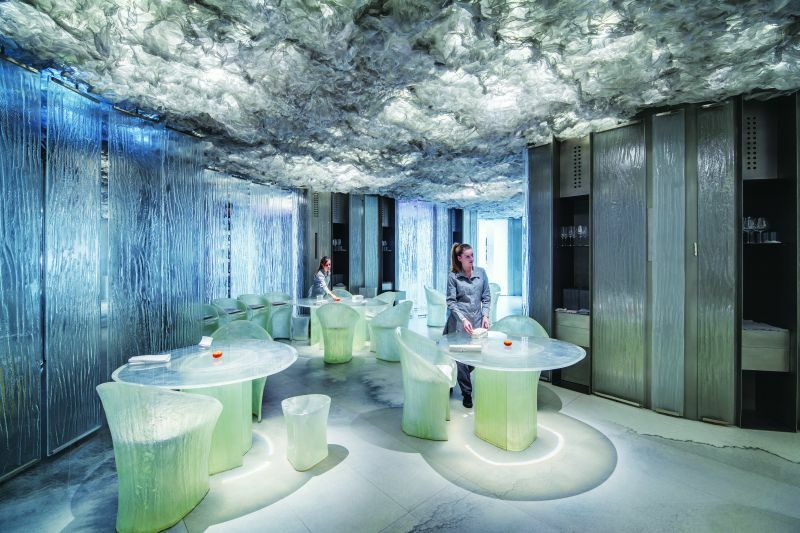 .Renowned Catalan chef, Albert Adrià, sets out to create an immersive environment that would provide an “out of this world” experience for his guests in his ENIGMA Restaurant in Barcelona, Spain. In an incredibly creative collaboration, 2017 Pritzker Prize winners, RCR Arquitectes, and architect Pau Llimona designed an organic space full of curves and narrow aisles. The design was drawn as a watercolour painting the size of two A1 sheets, which had to be applied to the walls, floors, bathrooms, kitchen worktops, cabinets and air-extraction system. Bringing the design to life posed an unprecedented challenge for Neolith® by TheSize, since a watercolour design had never been done on Sintered Stone before. The architects also wanted every slab to be of irregular texture like Neolith’s Riverwashed, but with a subtle shine to provide a surface that is multisensory. Through research and development, Neolith developed the technology to re-create the design onto slabs. Once this was achieved, an exact colour match had to be sourced, as the green and blue tones are unusual hues for sintered surfaces. The intensity of the colours also had to fit in with the other materials and decor throughout the restaurant to achieve a unified environment. For the installation, a coordinate system was put into place, labelling every slab to indicate its exact position. The curvy design and narrow aisles also meant that the slabs had to be cut down into six smaller pieces, the smallest being only 3cm wide. 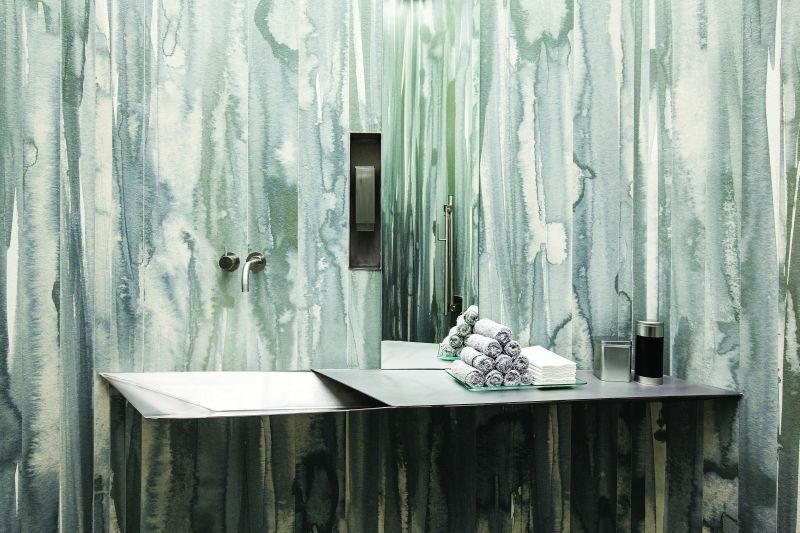 With each slab being unique, it had to be put together with absolute precision to achieve the uniformity of the watercolour design. The floor presented the biggest challenge because of its sheer size and was initially installed off-site in its entirety. A drone was used to take images from above to get a full picture, thus ensuring that there were no inconsistencies. 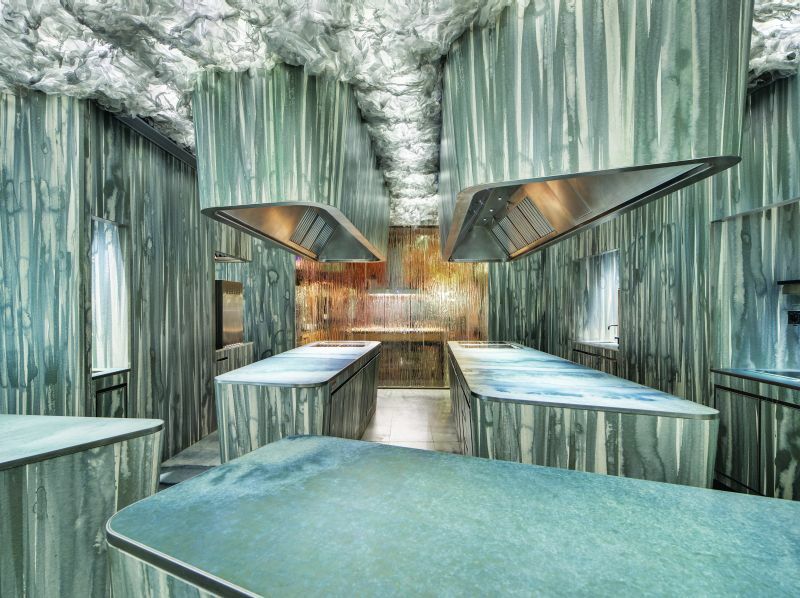 The intensity of the colours of the sintered surfaces had to fit in with the other materials and decorations throughout the restaurant to achieve a unified environment. Courtesy of Neolith® by TheSize. Full thanks and acknowledgement are given to Neolith® by the Size and v2com for the information given to write this article. Caption Main Image: The architects’ watercolour design was applied to the walls, floors, kitchen worktops, cabinets and air-extraction system. Courtesy of Neolith® by TheSize.